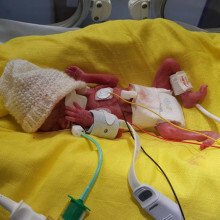 Imogen was born with a rare condition known as Poland syndrome, which effects very few children and is characterised by the webbing of the fingers and underdevelopment of chest muscle. As a result, Imogen has undergone two major surgeries at Leeds Children's Hospital during which time her parents have been supported at Eckersley House. To have that access to your child in hospital is so important and something every parent with a seriously ill child should have. 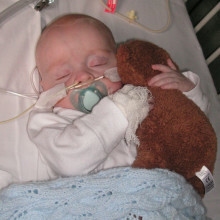 Rupert was diagnosed with pulmonary stenosis and an atrial septal defect when he was just a few months old. After this his condition was monitored closely by a specialist team, but his parents were told he would need surgery when he was older. 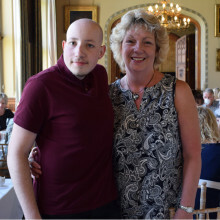 Earlier this year Rupert underwent that surgery and, whilst he recovered from the successful operation, his parents were supported in Eckersley House. Not knowing what the future holds is tough, but we will get there, one day at a time. 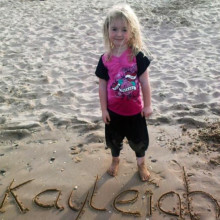 Alayna Bateson spent the first six months of her life in hospital, three of which were spent in Leeds Children’s Hospital. After a month the family moved into Eckersley House. Once there they were able to be together as a family and Sophie and Jezz's little boys loved the playroom, whilst a few of Alayna's parents' considerable worries were alleviated. Paige stayed with The Sick Children's Trust for two weeks at Eckersley House when Quinn was rushed back into hospital shortly after being born and required an emergency transfer to Leeds Children’s Hospital from Bradford Royal Infirmary. Eckersley House is a great friend to have. We're celebrating 25 years of supporting families with seriously ill children undergoing treatment at St James's Hospital and Leeds Children's Hospital. Linda Bastiman and her son Chris share their experience of how Eckersley House helped them in 2006. 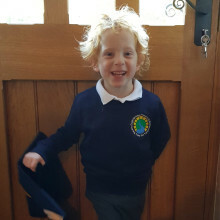 Niall Manning, from Lincoln, who overcame meningitis and heart failure at just six years old is preparing to start secondary school this September. 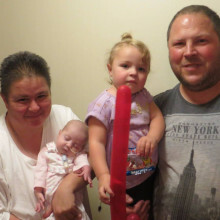 Twin survives heart surgery to start school this September! 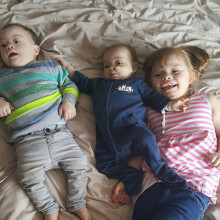 Parents Chris and Wendy Watkins talk about how Eckersley House kept them by their son Riley's bedside, but also how having a 'Home from Home' meant that Riley was hardly separated from his twin, Noah. 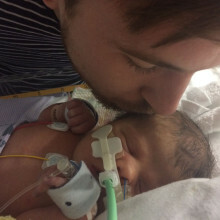 On Saturday 11 August, Dad Jaydan will be cycling 300km in 20 hours to thank The Sick Children's Trust for keeping his family together while his son, Rio, underwent numerous operations and procedures during his short life. 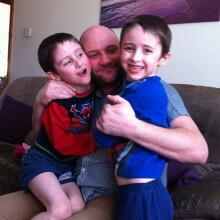 He hopes to raise £750 in his son's memory. 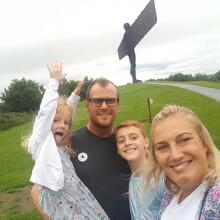 Tom is on a fundraising mission as thanks for keeping his family together when his daughter, Agnes, needed lifesaving treatment at Leeds General Infirmary (LGI). I can safely say that the only reason we have managed to get through these past months with our sanity intact is because our family has been able to stay at Eckersley House run by The Sick Children’s Trust. Leah, who was diagnosed with a rare liver disease shortly after she was born, has been receiving lifesaving treatment at Leeds General Infirmary over the past six months. 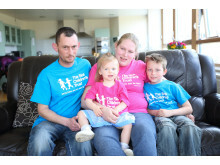 Throughout this time her parents and two young siblings have been supported at Eckersley House. Here, her grateful father, tells their story. I instantly understood why The Sick Children’s Trust call their houses ‘Homes from Home’ – even in the midst of all the fear and uncertainty, we really got the sense of being at home. 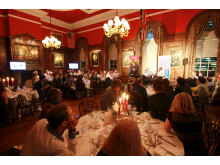 On Saturday 5 May, supporters are invited to join The Sick Children's Trust at Carlton Towers for afternoon tea. The event is being held in honour of a little girl called Kayleigh, whose family were supported at Eckersley House and whose story has inspired a Castleford businesswoman to donate her wedding venue. 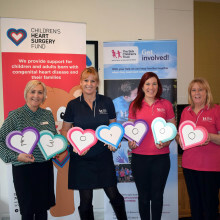 This was my second time being supported by The Sick Children’s Trust at Eckersley House and once again the charity proved to be a lifeline during a very stressful time. 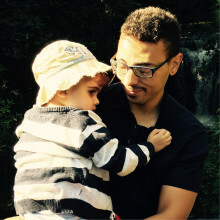 Adrian and his partner Emma stayed at Eckersley House whilst their newborn son, Aston, recovered from a lifesaving operation in LGI earlier this year. Aston was born with a huge 2kg tumour growing at the base of his tailbone. 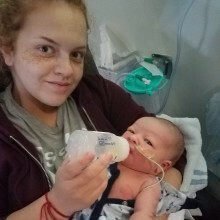 The horrified parents could not have been more grateful to The Sick Children's Trust when they were given a room and moved in before Aston's terrifying 11.5 hour operation. Ellie-Marie had a very rocky start to life with doctors struggling for 45 minutes to establish an airway. 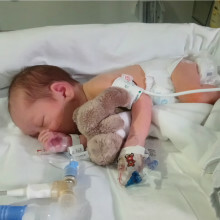 Fortunately she was born at Leeds General Infirmary and the specialist team were able to save her. 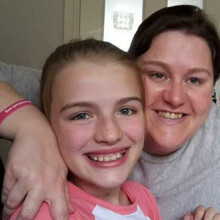 She spent months in hospital having been diagnosed with a rare condition, Pierre Robin Sequence and whilst she was receiving lifesaving treatment we supported her family at Eckersley House. 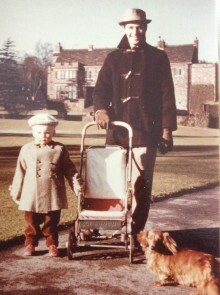 Thomas' parents stayed at both Eckersley and Crawford House when their baby son, Thomas, was seriously ill as a baby. Finally it was discovered that Thomas had a rare primary immune deficiency disorder meaning that he did not have the ability to generate antibodies needed to fight off infections and would require a stem cell transplant when a donor became available. Alex and I owe Dr. Mary Barraclough everything. Without her, Henry would not be here today. 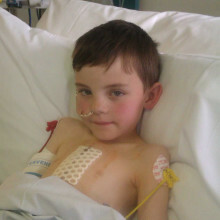 Henry, was diagnosed with leukaemia back in September. Having been transferred to Leeds General Infirmary (LGI) for lifesaving treatment, his family were supported by The Sick Children’s Trust. Fortunately Henry has made it home in time for Christmas, and although he is still undergoing treatment as an outpatient, is excitedly getting ready to celebrate with his family. 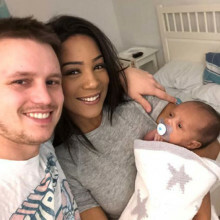 "Friday 13th is an unlucky day for some, but for Tom and I, it was the amazing day we got to meet our son for the first time." Albie’s parents knew he would need lifesaving surgery soon after birth and had heard about the work of The Sick Children’s Trust. 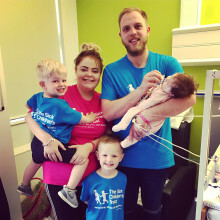 Their baby spent over three weeks recovering in hospital and during this time the charity supported his family at Eckersley House. 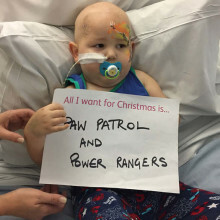 And as thank you, Albie and his family have joined in The Sick Children’s Trust first ever Christmas appeal!